Monascus pigments that were generally produced intracellularly from Monascus spp. are important natural colorants in food industry. 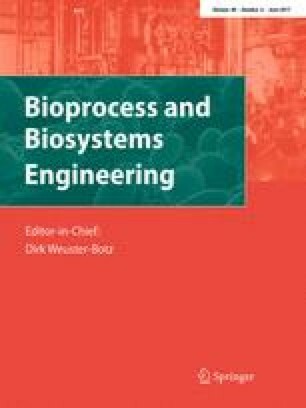 In this study, change of pigment metabolism and secretion was investigated through fed-batch extractive fermentation and continuous extractive fermentation. The biomass, secreting rate of pigment and total pigment yield closely correlated with the activated time of extractive fermentation as well as the composition of feeding nutrients. Metal ions played a key role in both the cell growth and pigment metabolism. Nitrogen source was necessary for a high productivity of biomass but not for high pigment yield. Furthermore, fermentation period for the fed-batch extractive fermentation could be reduced by 18.75% with a nitrogen source free feeding medium. Through a 30-day continuous extractive fermentation, the average daily productivity for total pigments reached 74.9 AU day−1 with an increase by 32.6 and 296.3% compared to that in a 6-day conventional batch fermentation and a 16-day fed-batch extractive fermentation, respectively. At the meantime, proportions of extracellular pigments increased gradually from 2.7 to 71.3%, and yellow pigments gradually became dominated in both intracellular and extracellular pigments in the end of continuous extractive fermentation. This findings showed that either fed-batch or continuous extractive fermentation acted as a promising method in the efficient production of Monascus pigments. The authors gratefully acknowledge the financial support of the National Natural Science Foundation of China (No. 31271925), the Special Project on the Integration of Industry, Education and Research of Guangdong Province, China (No. 2013B090600015), and the Science and Technology Program of Guangzhou, China (No. 2014J4100192).